The Library of Congress released a report today on “The Survival of American Silent Feature Films: 1912-1929.” Of 10,919 American silent feature films during that time, only 14 percent—about 1,575 titles—exist in their original format. 14% of the feature films produced domestically from 1912-1929 survived in their original-release 35 mm format. 11% of the films are complete as foreign versions or on lower-quality formats, such as 28 mm or 16 mm. 5% are incomplete, either missing a portion of the film or existing only as an abridged version. Of the more 3,300 films that survived in any form, 26% were found in other countries. Of the silent films located in foreign countries, 24% already have been repatriated to an American archive. 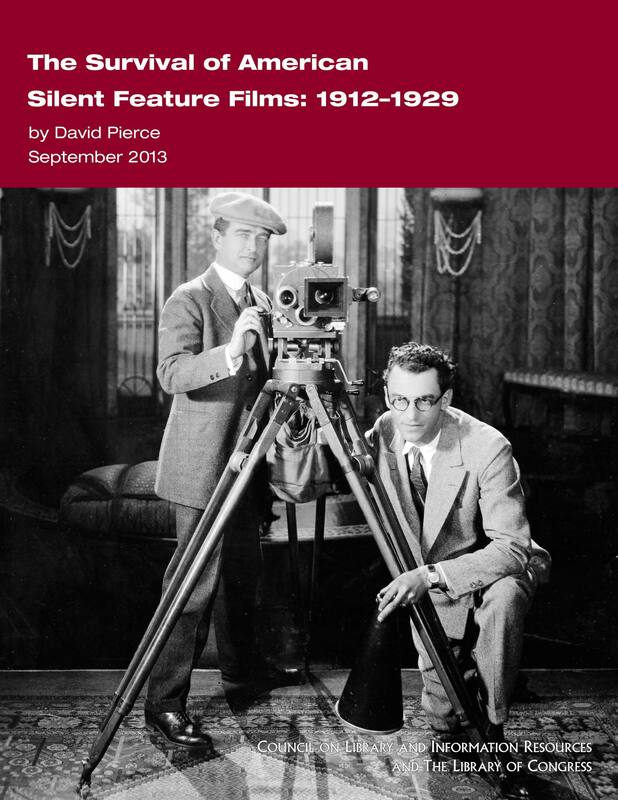 “This report is invaluable because the artistry of silent film is essential to our culture,” said Martin Scorsese. In addition to the establishment of the National Film Preservation Board (NFPB), the National Film Preservation Act of 1988 called for the Librarian of Congress to establish initiatives to protect the nation’s film heritage. The report is available as a free download at the NFPB’s website www.loc.gov/film/ as well as CLIR’s website (www.clir.org/pubs/reports/pub158). An inventory can be found here. Loss of nitrate film stock to fire, deterioration, industry neglect and destruction of prints and negatives were among the culprits. Notable films considered lost in their complete form include Lon Chaney’s “London After Midnight” (1927); “The Patriot” (1928); “Cleopatra” (1917); “The Great Gatsby” (1926), and all four of Clara Bow’s feature films produced in 1928. Only five of Will Rogers’ 16 silent features survived and 85 percent of features made by Tom Mix—Hollywood’s first cowboy star—are lost. Fund archival preservation programs to digitally scan and restore film collections. The Swiss and Norwegian governments have been doing this. “Encourage coordination” needs to go further. It requires scanners, people, and resources. Of course, digital archives are not much more resilient than nitrate film stock. Hard drives have an almost certain probability of failure. So, we need to find a truly enduring and durable archival medium. Solid state?